Your contract is with GeoTenerife Limited, a limited company (trading as GeoTenerife), registered in England and Wales under company registration number: 8356919 having our registered office at Wood Cottage, Ashtead Woods Road, Ashtead, Surrey, KT21 2EN. 1. Your internship contract When you make a booking you guarantee that you accept and do accept the terms of these booking conditions. A contract will exist as soon as we issue our confirmation invoice. This contract is made on the terms of these booking conditions, which are governed by English Law, and the jurisdiction of the English Courts. If you had not seen these terms and conditions when you made your booking and you are not happy to proceed with the booking now that you have seen them please return all documentation to us, within 24 hours of receiving these booking conditions. Your booking will be cancelled and your monies will be returned in full, provided you have not commenced your travel. This clause does not apply if your booking was made within 10 weeks of travel, or in the case of Non-Cancellable internships as set out in section 6 below. i) The price of your Internship includes accommodation and transfers as confirmed together with specified local transport, visits, guiding and lectures. ii) We reserve the right to alter the prices of any of the internships shown in our website. You will be advised of the current price of the internship that you wish to book before your contract is confirmed. iii) When an offer of an internship is made to you, you must confirm acceptance within 24 hours and settle the amount due within 5 days or your place will be offered on. Internships are in high demand. Flights are your responsibility to organise, book and pay for. GeoTenerife will only assume responsibility for the provision of your accommodation, your internship and be responsible your transfers to and from your accommodation from the airport as confirmed on your invoice. GeoTenerife cannot be held responsible for difficulties arising from delayed or cancelled inbound or outbound flights, although of course we will endeavour to assist you to reorganise your accommodation, internship and transfers as best we can to ensure a successful internship. If your inbound flight is cancelled or delayed we will endeavour to rearrange your accommodation, internship and transfers as best possible but this may incur an extra cost for you if it means, for example, that we need to re-hire a transfer for you if your flight is severely delayed and the transfer contracted cannot wait. We cannot be responsible to refund you for any services which you do not use as a consequence of any flight problems. If, after our confirmation invoice has been issued, you wish to change your travel arrangements in any way, for example your chosen arrival time, we will do our utmost to make these changes but it may not always be possible. 6. If We Change or Cancel Your Internship As we plan your internship arrangements many months in advance we may occasionally have to make changes or cancel your booking and we reserve the right to do so at any time. If we make a major change to your internship, we will inform you as soon as reasonably possible if there is time before your departure. You will have the choice of either accepting the change of arrangements, accepting an offer of alternative travel arrangements of comparable standard from us if available or cancelling your internship and receiving a full refund of all monies paid. In some cases we will also pay compensation (see below). These options don’t apply for minor changes. Examples of minor changes include a change of accommodation to another of the same or higher standard, or change of expert on a given day to another of a similar standard. Last-minute changes can sometimes occur during your internship due to traffic, delays, or agreed sites or experts not being available at the last minute. These do not come under the heading of major changes. All reasonable efforts will be made to secure visits to specific sites or installations or access to particular experts as agreed at the time of booking. However, should the specified expert or site or installation not be available for reasons out of our control on the day (eg through local strikes, illness), we will endeavour to move the visit or expert appointment to another day during your stay or try to make what we deem to be suitable alternative arrangements at a similar site or equivalent expert for you. GeoTenerife will not accept liability for changes in your agreed schedule due to issues out of our control. We will not cancel your travel arrangements less than 12 weeks before your departure date, except for reasons of force majeure or failure by you to pay the final balance. If your internship is cancelled you can either have a refund of all monies paid or accept an offer of alternative arrangements of comparable standard from us, if available). In some cases we will pay compensation. If you have a problem during your internship, please inform our GeoTenerife representative immediately who will endeavour to put things right. If your complaint is not resolved locally, please follow this up within 28 days of your return home by writing to our registered office giving your booking reference and all other relevant information. Please keep your letter concise and to the point. It is strongly recommended that you complete an Incident Report Form whilst in resort, which will be supplied by your GeoTenerife representative. If you fail to follow this simple procedure we will have been deprived of the opportunity to investigate and rectify your complaint whilst you were in resort and this may affect your rights under this contract. (ii) Any relevant international convention, for example the Paris Convention in respect of the provision of accommodation, which limit the amount of compensation that you can claim for death, injury, delay to passengers. We are to be regarded as having all benefit of any limitation of compensation contained in these or any conventions. GeoTenerife is not liable for any delay, cancellation or mishap involving your flight to or from the island, as that is your responsibility to book for and seek insurance against, where relevant. You can ask for copies of the transport companies’ contractual terms, or the international conventions, from our offices at Wood Cottage, Ashtead Woods Road, Ashtead, Surrey, KT21 2EN. NB this clause does not apply to any separate contracts that you may enter into for excursions or activities whilst on the internship. If the internship contract we have with you is not performed or is improperly performed as a result of failures attributable to a third party unconnected with the provision of the services, or as a result of failures due to unusual and unforeseeable circumstances beyond our control, the consequences of which could not have been avoided even if all due care had been exercised, or an event which we or our suppliers, even with all due care, could not foresee or forestall, and you suffer an injury or other material loss, we will offer you such prompt assistance as is reasonable in the circumstances. Excursions or other tours that you may choose to book or pay for whilst you are on internship are not part of your internship provided by us. For any excursion or other tour or outing that you book, your contract will be with the operator of the excursion or tour and not with us. We are not responsible for the provision of the excursion or tour or for anything that happens during the course of its provision by the operator. Our website is prepared many months in advance and though every effort is made to ensure accuracy, it is to be expected that some of the prices or details contained on our website may have changed since the content was prepared and written. We will notify you of any changes that we are made aware of, however we do restrict the advice to what we consider is a significant part of your internship arrangements with us. Facilities and excursions may not be available at the time of your internship owing to adverse weather conditions, lack of demand, local strikes or industrial action, unforeseeable events, maintenance issues, or if it is the start or the end of the season. If we are forewarned of any building works at or close to your accommodation that may affect the enjoyment of your stay there, we will do our best to advise you about it before your departure. It is your responsibility to ensure you behave in a responsible manner while in resort to avoid discomfort or nuisance to other guests and students. It is your responsibility and a condition of this contract that you are adequately insured for the internship and any event, excursion or activity that you intend to participate in during your internship. We recommend that you take out comprehensive travel insurance. We cannot accept any responsibility for any failure on your part to take out adequate travel insurance cover for your internship. It is a condition of this contract that you ensure that you obtain a European Health Insurance Card valid for your period of travel, or valid private health insurance if not a member of the EU. We reserve the right to terminate without notice and liability the internship arrangements of any person whose behaviour is such that it is likely, in our opinion or that of any accommodation owner or guide to cause anguish, hazard, harm, or annoyance to other customers, employees, property or to any third party. If any person or persons are prevented from travelling because in the opinion of any person in authority they seem unfit to travel or liable to cause discomfort or disturbance to other customers, our responsibility for the person or persons internship will then come to an end. In all cases full cancellation charges apply and we will be under no responsibility whatsoever for any cost incurred. It is the full responsibility of students on the trip to ensure appropriate behaviour at all times while on the internship. This is especially important when visiting industrial sites or protected areas where it is incumbent on the group to behave responsibly and adhere to any instructions given by GeoTenerife or related experts. It is also incumbent on students to take reasonable care and precaution at all times throughout the internship to ensure their own safety and that of their peers. GeoTenerife will not accept liability for any problems or consequences arising from any member of the group behaving inappropriately at any time, including but not solely due to an excessive consumption of alcohol. The Canaries are a popular holiday destination, but students must bear in mind that Spanish local standards may differ from those in the UK. Students must adhere to accepted behavioural and moral standards throughout the internship to avoid causing distress, discomfort or upset to others throughout. Moreover, GeoTenerife will not accept any liability for delays incurred during your internship by students not adhering to the agreed schedule. Although at all times GeoTenerife will endeavour to reschedule events as best possible for you, students must, at all times, behave in a professional manner and cooperate with the agreed timings to ensure a successful internship for all concerned. Some sites or installations have their own, common-sense, safety and behavioural requirements and students hereby agree to adhere to them at all times to ensure their own safety and that of their peers. A copy of these can be requested from GeoTenerife at Wood Cottage, Ashtead Woods Road, Ashtead, Surrey KT21 2EN. I have read and agree to abide by GeoTenerife’s Internship Terms and Conditions. I understand that I am responsible for due care of the accommodation provided and hereby agree to look after it and respect it at all times. Failure to do this at any time will result in the immediate termination of your internship, with no further responsibility liable to GeoTenerife. I accept I am responsible for my own professional work ethic at ALL times. I will follow safety instructions and procedures at all times, and accept that some work, such as at the Involcán laboratory, may involve hazardous work and materials. I take full responsibility for working safely and professionally at all times. GeoTenerife will not accept any responsibility for accidents or mishaps arising from your failure to adhere strictly to this condition. Failure to observe any of these clauses will result in the immediate termination of the internship, which means you will have to make your own arrangements to get back to the UK at short notice and not receiving your INVOLCAN reference and certificate. 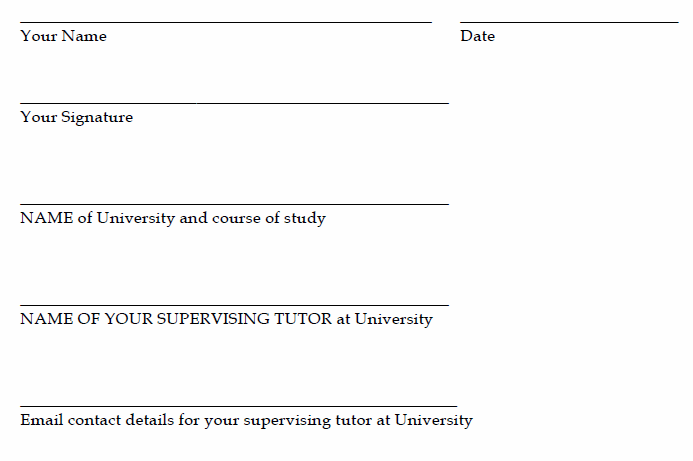 Furthermore, a full report made to your supervising University tutor. Please fill in and send, a full copy by first class post to: GeoTenerife Ltd, Wood Cottage, Ashtead Woods Road, Ashtead, Surrey KT21 2EN.